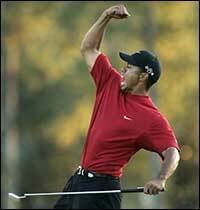 Tiger Woods could very well be the greatest athlete of all time. That is difficult to write being a die-hard Jack Nicklaus fan, but it is becoming easier every year to make the argument. Tiger has won two major championships in a row, The British Open (now just called "The Open Championship) and the PGA Championship, not to mention 4 PGA events in a row, a feat that is near impossible. I just read that Woods finished at the top of the leaderboard in the first round of the Deutsche Bank Championship, meaning that Woods is gunning for his 5th straight win. If Woods can hold on to even half this pace throughout his career, we are witnessing history that will never be broken again. While Tiger is amazing I have difficulty concieving of him as the greatest athlete of all time. greatest golfer? Sure thing. And maybe in the top 20 for athletes over all. People like Michael Jordan, Muhammad Ali, Jim Brown, Wayne Gretzky, Willie Mays, Gordie Howe, Carl Lewis, Martina Navratilova all score higher to me. But that is, of course, opinion. Yeah, it all comes down to how you define "greatest athlete." And I don't think that is an easy thing to do. But I'm not sure there has ever been anyone who stood so clearly about the rest of the athlete's in his or her sport. Is he a better "athlete" than the best decathalete or the best basketball player or whatever? As I said, it all comes down to definitions.